I have a 4-year-old. She can safely play with toys that are labeled 3+ and have all of those tiny choking hazard parts. My 2.5-year-old cannot because he likes to put everything in his mouth. And once the newborn is crawling around, all of those little parts are going to be health hazards to her, too. I’m having to remind myself that just because one kiddo is in a new, safer stage, there are still two more who aren’t quite there yet. I’ll have to look at babyproofing with fresh eyes, which is why I love this list from Parent.Guide. It’s a great safety reminder of many of those hazards you might not think about — or that you haven’t had to think about in a few years if you have older kiddos! 1. Electrical outlets. It’s almost as if electrical outlets were designed with your baby’s destruction in mind. Not only do they sit at your baby’s eye level, but they also have switches and holes, just like all the coolest baby toys. Unlike baby toys, electrical outlets pose a serious risk of electrocution to your baby. Fortunately, electrical outlets are incredibly simple to babyproof. The most common safety method is to purchase a bag of plastic outlet plugs. These plugs slide inside the socket holes and prevent any objects from being pushed inside. The plugs can easily be removed by larger hands when the use of an outlet is required. If you are ever in a bind you can effectively babyproof an electrical outlet with little more than a role of thick duct tape. Simple place a strip over the socket holes and your baby will be unable to poke any objects inside the outlet. 2. Doors. You walk through them every day and until you have a baby you will probably never give them a second thought. Not only do doors prevent your baby from wandering off unsupervised, they are also a hazard in themselves with little fingers easily being pinched in a closing door. A hook and eye lock mounted out of your baby’s reach is a cheap and effective way to prevent your baby from opening doors. To prevent a door constantly used as thoroughfare from pinching fingers, you can simply hang a folded towel over the top of the door on the hinged side. 3. Stairs. According to Centers for Disease Control and Prevention, roughly 8,000 children are treated in emergency rooms across the United States for fall-induced injuries. The most commonly reported falls were associated with the staircase. You may notice that while your baby is learning to walk he will constantly be falling over on flat, level sections of floor. Obviously adding steps to the mix is only going to increase the likelihood of your little one taking a tumble. Baby gates are an absolute must for any household with a staircase. Placed both at the top and bottom of a staircase, baby gates coupled with attentive parenting have proven to be effective in preventing staircase falls. 4. Bathtub. Many mothers incorporate a bath into their little one’s daily routine. As a young baby can drown in less than an inch of water, you will be want to extra diligent whenever you mix the two. Do not leave your baby alone in the tub for any reason. If you have to get up to answer the door or phone, wrap your baby up and take him with you. Nothing you need to do is worth the risk of your baby drowning. A simple method to prevent your baby from squirming all over the place is to fill a tub with water and add a plastic laundry basket to the tub. Place your little one in the basket and you now have an enclosure that keeps your little one within easy reach. 5. Curtains and blinds. Tassels and cords that are used to open and close blinds or curtains represent a suffocation hazard to your baby. A baby can easily get these tangled around the neck while exploring your home. The easiest way to keep your baby safe around tassels and cords is to tie them up at a height that is out of your baby’s reach. 6. Cabinets and drawers. Cabinets and drawers on their own do not present much of a threat to your baby. It’s what hides inside that is the issue. Cabinets can hide anything from cleaning products and medicines to sharp knives and breakable glasses. The easiest way to babyproof drawers and cabinets while you have a baby on the loose is to use your baby’s small size to your advantage. Move all dangerous objects to high cabinets or areas that are out of reach. It may take some adjustment, but keep in mind this is only a temporary measure. You can move everything back once your baby is past the early exploration phase. For those who do not have the option of relocating all the dangerous objects, magnetic cabinet and drawer locks are an effective method of keeping babies from getting their hands on anything dangerous. 7. Coffee tables. Coffee tables appear on most babyproofing lists and with good reason as they are a serious liability to your baby. Pointed corners that sit at your baby’s head height? It’s a recipe for disaster. You are going to need to find a way to soften up those corners. You can purchase purpose made bumper pads, but it is just as easy to ball up old towels with a bit of masking tape to cover the corners. It may not be pretty, but it gets the job done. 8. Fireplace. It goes without saying that hot temperatures and babies don’t mix. When you have your fireplace roaring in the cooler months, you will want to make sure your baby is kept safe and sound. As flickering flames can catch the attention of a curious baby, the easiest way to babyproof a fireplace is to keep your little one away from it all together. You can either do this through the use of a long baby gate stretched around the entire fireplace or placing your baby in a play pen when the fire is in use. 9. Your baby’s perspective. It’s amazing how seeing the world from a different perspective can change your view on things. While you might see a bookshelf, your baby sees a fun climbing ladder. It’s this differing viewpoint that can cause you to miss potential hazards that need babyproofing. Getting down on your hands and knees is an effective method for determining dangers to your baby that otherwise are easily missed. Cords that can be pulled, pointed objects at head height, mold that can enter a baby’s mouth and cause sickness — it is amazing what is hiding in your own home just below your knees. Use this technique in each room of your house, and you may be surprised at what you find. 10. Car. While you are rushing around babyproofing your house it can be easy to forget to babyproof your car. Don’t forget that making a car baby safe is not just limited to its interior. Be extra mindful when reversing out of your driveway, particularly when your little one is playing nearby. In the U.S., 50 children are backed over each week. You do not want your little one to end up as a statistic. While this list is by no means exhaustive, it is a great resource to help get your head into babyproofing mode. all are the really great info. You’ve shared details and I’ve understood. thanks for your informative post. please keep posting. I love your blog so much. Great information!! I really appreciate your writing. It will help me out specially all of moms who have very little baby trying to do baby proofing their house. 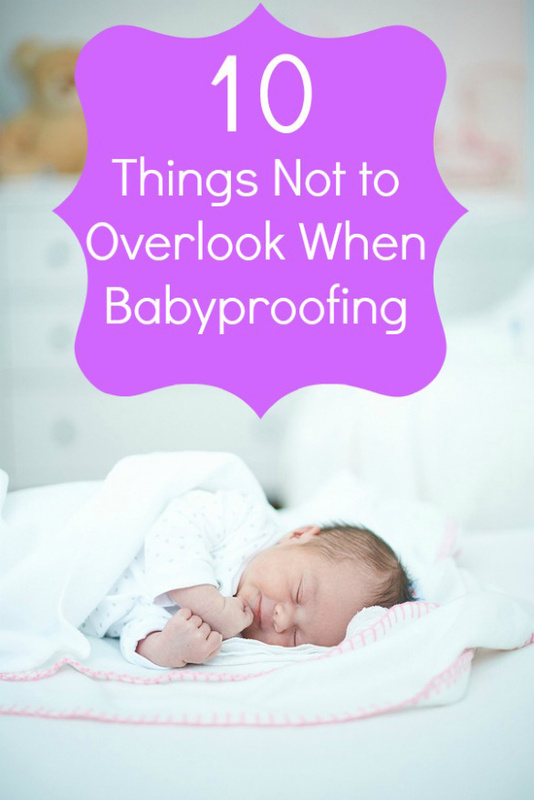 Thanks for sharing this awesome list of things to look out for when babyproofing. I find it very resourceful.